After unsuccessfully trying to have a response published by BLOOMBERG, TKAG posts it’s views on Falcon CEO’s SA wish list. Here is the article by Bloomberg: TKAG response below. Falcon Oil & Gas Ltd. expects to be awarded a permit to start exploration at its shale plot in the Karoo basin in South Africa in the second half of the year after technical regulations are published. “Our focus will be South Africa over the next 12 months,” Chief Executive Officer Philip O’Quigley said in an interview. The Dublin-based company, which signed a five-year exclusive co-operation agreement with Chevron Corp. in 2012, may sell a stake in the asset following the approval. The Karoo basin in the southern part of the country may have 390 trillion cubic feet of technically recoverable gas, making it the world’s eighth-biggest shale-gas deposit, according to the U.S. EnergyInformation Administration. Falcon holds 7.5 million acres, according to a company presentation. South Africa has published draft regulations for the shale gas industry, which require drillers to meet American Petroleum Institute standards governing the type of equipment used and the disclosure of chemicals. Final rules are due to be issued in the next few months. Earlier in the year, parliament approved separate legislation which will grant the government the right to take a 20 percent free stake in all new oil and gas projects and acquire a further unspecified share at an agreed price. President Jacob Zuma was asked to hold off on signing the law pending a review by a ministerial committee that will aim to ensure the law doesn’t discourage investment, Ramatlhodi said. “We are delighted the government wants oil and shale gas exploration to start as soon as possible,” O’Quigley said. Falcon has assets in the Beetaloo basin in Australia, where it’s planning to drill three wells this year, and in Hungary, where it’s looking for a company to further develop the license. Chief Executive Officer of Falcon Oil and Gas Ltd. I have read in the press (Bloomberg July 11 2014) of your company’s anticipation that it will receive a permit from the South African government to commence exploration in the unique and sensitive Karoo basin ‘in the second half of the year’ and following the publishing of technical regulations. TKAG has communicated with your venture partner, Chevron Corporation with regard to its involvement in this Karoo acreage, and in August of 2013 suggested that Chevron may wish to invest some time in reviewing the Environmental Management Plan (EMP) submitted by Falcon in 2011 to the Petroleum Agency of Southern Africa. TKAG and our alliance partners remain shocked and dismayed at the cavalier attitude displayed by Falcon and Chevron to the introduction of shale gas mining into a uniquely sensitive area in a water-scarce country and under the spectre of a plethora of unresolved issues standing between your company and a permit to commence exploration and possibly full production via fracking in South Africa. Mr. O’Quigley, it is my obligation and duty to inform you that the issue of a permit to your company to commence exploration in South Africa for shale gas may be somewhat further away than you have publicly anticipated. I might add too that even should you have the permit to hand in the next five months, it may be far longer than that, before your company starts breaking ground in the Karoo, if ever. In essence, just because Falcon, Chevron et al are fracking elsewhere in the world doesn’t mean that you will succeed in bringing shale mining here. TKAG and its alliance partners are not opposed to responsible and sustainable development of natural resources for the present and future benefit of South Africans. We will not submit to the imposition of a technology such as this under the current circumstances in South Africa – circumstances of which Falcon and Chevron are fully aware and which will militate against the commencement of this process in South Africa. We invite you to send a representative to a press conference in Sandton, Johannesburg on July 22nd at which TKAG and its alliance partner, AfriForum will reveal a significant development in the shale gas debate in South Africa. Energy independence from shale up in smoke? The shale mining fraternity, still reeling from the release of a Scientific Report on the effect of shale gas mining – released by the Canadian Council of Academies has been dealt another blow with the news that the golden energy goose of California has been reduced by 96% – by the US Energy Information Administration. The industry and its proponents in government and commerce have long been warned about the overhyping of shale gas assets in the US. Even in South Africa, the original estimates by the USGS, of 485tcf have been downgraded by South Africa’s own scientists to a ‘best case extraction scenario of 40tcf. Federal energy authorities have slashed by 96% the estimated amount of recoverable oil buried in California’s vast Monterey Shale deposits, deflating its potential as a national “black gold mine” of petroleum. Just 600 million barrels of oil can be extracted with existing technology, far below the 13.7 billion barrels once thought recoverable from the jumbled layers of subterranean rock spread across much of Central California, the U.S. Energy Information Administration said. The new estimate, expected to be released publicly next month, is a blow to the nation’s oil future and to projections that an oil boom would bring as many as 2.8 million new jobs to California and boost tax revenue by $24.6 billion annually. The Monterey Shale formation contains about two-thirds of the nation’s shale oil reserves. It had been seen as an enormous bonanza, reducing the nation’s need for foreign oil imports through the use of the latest in extraction techniques, including acid treatments, horizontal drilling and fracking. 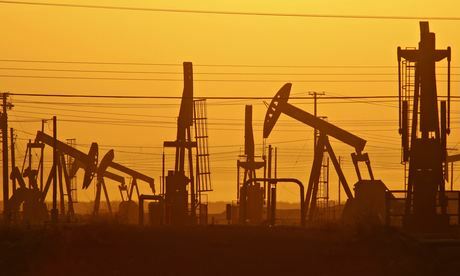 The energy agency said the earlier estimate of recoverable oil, issued in 2011 by an independent firm under contract with the government, broadly assumed that deposits in the Monterey Shale formation were as easily recoverable as those found in shale formations elsewhere. The estimate touched off a speculation boom among oil companies. The new findings seem certain to dampen that enthusiasm. Kern County in particular has seen a flurry of oil activity since 2011, with most of the test wells drilled by independent exploratory companies. Major oil companies have expressed doubts for years about recovering much of the oil. The problem lies with the geology of the Monterey Shale, a 1,750-mile formation running down the center of California roughly from Sacramento to the Los Angeles basin and including some coastal regions. Unlike heavily fracked shale deposits in North Dakota and Texas, which are relatively even and layered like a cake, Monterey Shale has been folded and shattered by seismic activity, with the oil found at deeper strata. Geologists have long known that the rich deposits existed but they were not thought recoverable until the price of oil rose and the industry developed acidization, which eats away rocks, and fracking, the process of injecting millions of gallons of water laced with sand and chemicals deep underground to crack shale formations. The new analysis from the Energy Information Administration was based, in part, on a review of the output from wells where the new techniques were used. “From the information we’ve been able to gather, we’ve not seen evidence that oil extraction in this area is very productive using techniques like fracking,” said John Staub, a petroleum exploration and production analyst who led the energy agency’s research. “Our oil production estimates combined with a dearth of knowledge about geological differences among the oil fields led to erroneous predictions and estimates,” Staub said. Compared with oil production from the Bakken Shale in North Dakota and the Eagle Ford Shale in Texas, “the Monterey formation is stagnant,” Staub said. He added that the potential for recovering the oil could rise if new technology is developed. A spokesman for the oil industry expressed optimism that new techniques will eventually open up the Monterey formation. Rock Zierman, chief executive of the trade group California Independent Petroleum Assn., which represents many independent exploration companies, also sounded hopeful. “The smart money is still investing in California oil and gas,” Zierman said. Environmental organizations welcomed the news as a turning point in what had been a rush to frack for oil in the Monterey formation. “The narrative of fracking in the Monterey Shale as necessary for energy independence just had a big hole blown in it,” said Seth B. Shonkoff, executive director of the nonprofit Physicians Scientists & Engineers for Healthy Energy. The 2011 estimate was done by the Virginia engineering firm Intek Inc.
For California, the analysis throws cold water on economic projections built upon Intek’s projections. In 2013, a USC analysis, funded in part by the Western States Petroleum Assn., predicted that the Monterey Shale formation could, by 2020, boost California’s gross domestic product by 14%, add $24.6 billion per year in tax revenue and generate 2.8 million new jobs. Breaking news from a leaked Canadian report on fracking reveal serious concerns underpinned by scientific investigation. The report commissioned in 2012 by former Canadian environment minister Peter Kent, has been developed by the Council of Canadian Academies, ‘an arm’s-length scientific body‘ to provide an overview of the known scientific research on fracking. Many of the impacts, risks and conclusions drawn in the report have since 2011, been hi-lighted by TKAG and other South African stakeholders in formal communication to the South African public and various departments of the South African government as well as the Cabinet of South Africa. This report – soon to be available in an unabridged version is a vindication of the position that those opposed to shale gas mining have held in SA since 2011. Scientific documents of this nature, readily available to the ANC and its heads of Department will greet the organisation in Court when it has to justify its position and action in pushing this technology into South Africa in the manner in which it has stated it will do. A landmark report commissioned by Environment Canada has found water contamination to be the greatest threat posed by the shale gas extraction method known as fracking. The “Expert Panel on Harnessing Science & Technology to Understand the Environmental Impacts of Shale Gas Extraction” report finds publicly-available science on shale gas extraction to be woefully inadequate while pointing to a long list of potential negative environmental effects — of which water contamination is the most worrisome. “Most experts agree that impacts on water raise the greatest environmental concern by shale gas development,” says the report’s executive summary, a copy of which was obtained by iPolitics Wednesday. Increased greenhouse gas emissions, seismic activity, socioeconomic disruption and poor scientific monitoring also pose a problem for shale gas extraction, an established industry in British Columbia and Alberta but with potential in eastern provinces, the report says. Shale gas extraction, which is much more advanced in the United States than in Canada, has been proceeding without an adequate scientific understanding of its impacts, says the report’s conclusion. The report focuses specifically on shale gas extraction, which has been made possible thanks to advancements in two technologies: horizontal drilling along shale rock formations and multi-stage hydraulic fracturing, also known as fracking. Shale deposits have been identified around the world, but North America is ground zero for the so-called ‘shale boom’. Adequate regulation of shale gas fracking has been a pressing question for the industry, which has been the target of documentaries and environmentalist campaigns in the U.S. over the past several years. The anxiety over shale gas fracking eventually led former environment minister Peter Kent to commission the report in 2012. He asked the Council of Canadian Academies, an arm’s-length scientific body Ottawa occasionally turns to for advice, to provide an overview of the known scientific research on fracking. The council encountered a scientific field riddled with unknowns. “While tens of thousands of shale gas wells have been drilled across North America over the last two decades, mostly in the United States, there has been no comprehensive investment in the research and monitoring of environmental impacts,” the report says. Despite the knowledge gaps, the consensus among the panelists is that water contamination is the greatest threat. The report says a gas leak into groundwater poses the highest risk, which could happen if the gas travelled around the well or if it leaked through an improperly installed casing. “The potential impacts of leaking wells are not being systemically monitored, and predictions (on the impacts of leakages) remain unreliable,” the report says. There’s a second potential route for contamination, the report says. Fracking takes place inside rock about 1,000 meters below the surface and involves the breaking up of shale to release pockets of natural gas. The region where fracking occurs is much deeper than the groundwater level, but if there are pathways in the shale rock there’s a risk that natural gas — along with the fluids and chemicals used in fracking — could leak into groundwater, says the report. The climate change impacts of fracking could be positive if fracking leads to natural gas displacing more carbon-intensive fuels like coal, the report says. But if the shale boom takes investment away from renewable power, it could make things worse, it says. Potential seismic effects are minimal, but a greater threat comes from the storage of wastewater in emptied-out gas pockets, it says. The council says seismic monitoring can reduce impacts. Shale gas can have a dramatic effect on communities, increasing income inequality and pollution, the report says. A general lack of social acceptance and trust is also undermining the public’s understanding of shale gas, it says. The provinces, which have varying degrees of regulation when it comes to fracking, are ultimately responsible for making sure the industry operates responsibly, the report says. There will be governance challenges, however, given the disparate impacts of the industry on those near the operations and those who benefit, it says. B.C. is nurturing the exploration of its shale gas with the aim of becoming a hub for the export of liquified natural gas. Quebec and Nova Scotia currently have moratoriums on fracking while New Brunswick is updating regulations for the divisive shale gas operations happening there. The federal government — which has some jurisdiction over the shale gas boom through its regulation of toxic chemicals, emissions and fish habitat — has been sponsoring research programs on fracking’s impact while waiting for the Council of Canadian Academies report. The report will be released officially in full tomorrow. Oil and Gas specialist attorney, Luke Havemann weighs in on recent developments in the MPRDA and what they could mean for oil and gas majors eyeing shale gas in South Africa. DR LUKE HAVEMANN: ‘Catastrophic’ is a strong word, but in this situation, strong words are appropriate. We’re sitting with a situation where the legislation is threatening the very existence of the South African oil and gas industry. It is something you can use the word catastrophic for. ALEC HOGG: Just unpack it for us. DR LUKE HAVEMANN: Well, as you more than likely know, we have for some time been debating the Mineral and Petroleum Resources and Development Bill. There have been many problems with that bill over the course of the last few months. Many commentators have picked up on them, but the one that’s really sticking out at the moment is this one about the free trade interest and the additional further percentage that the government will be able to acquire down the line. What you’re really looking at there is the taking over essentially, of the endeavours of the oil and gas industry by the government. It has been described, as you know, as nationalisation by stealth but perhaps expropriation is a better term. I don’t know if you’d perhaps like me to get into those percentages. ALEC HOGG: Sure, but just before we get there we had Rob Davies on CNBC Africa this morning actually, being rather flippant about the resistance to this, saying that there are companies lining up to get involved in shale gas. So government doesn’t think it’s going to have any problems in finding new investors in this sector. DR LUKE HAVEMANN: Well, were those investors aware of the amendments made a week ago? This current possible percentage of 80 plus 20 – 100 percent of your operation being taken away from you – that only came into being a week ago. Yes, people have been lining up. We were an exceptionally attractive frontier province for some time now. The last few years have seen an explosion of interest in offshore and onshore acreage, but that was under a very different set of circumstances. The new set of circumstances, which was brought before the Mineral Resources Committee without input from the industry and even without input from the DA members of that committee, is something that’s very new so Mr Davies’ opinion should perhaps be tempered by knowledge of the fact that the current situation only recently came into being. We have yet to receive the industry’s comment on it. ALEC HOGG: It seems as though the media so far has been missing the point, certainly from the way you described it to us yesterday. There’s a free carry of 20 percent and I don’t know if too many people can argue with that. The country owns the shale gas, but the problem has been over and above the 20 percent. If I understand it correctly: up until last Wednesday, Shell would do their exploration and whatever business it decided to create in shale gas, it knew that it would have to give 20 percent to the government? DR LUKE HAVEMANN: Yes, that is the free carried interest. That was in the pipeline and that was understood. There was some resistance to it, but it wasn’t unacceptable and it could be lived with, so yes, that was the situation. ALEC HOGG: In addition to that, there was a further amount that government would be allowed – or the state of South Africa would be allowed – to buy in the growing concern, and that amount was 30 percent – correct? DR LUKE HAVEMANN: That’s correct. There was an option to acquire a further…in the amount of 30 percent and that has since changed. ALEC HOGG: All right. So at least the investors were falling over themselves apparently – according to Rob Davies – when they knew they had to give 20 percent of their business to the government and government would have the ability, if it so chose at some stage in future, to go up to 50 percent to a joint partnership. The problem is that 30 percent has changed. DR LUKE HAVEMANN: That’s correct. You hit the nail on the head. DR LUKE HAVEMANN: Eighty percent. 20 plus 80 and it gets you to 100 percent. ALEC HOGG: So it’s nationalisation, in other words. DR LUKE HAVEMANN: Well, that’s the word that’s been bandied about. When it first came to light in that Mineral Resources Committee meeting, the relevant members from the DA said ‘but this is nationalisation’. I think they were the ones who first used the word. It certainly smacks of it. It’s something that needs to be looked at very closely. ALEC HOGG: Let’s just understand this in terms that anyone can understand. Shell is going to spend two-and-a-half billion Rand/250 million US Dollars exploring. If it all comes out rosy, as we all hope as a nation, and then they might possibly spend another $10bn for argument’s sake, in creating a business here. If that business becomes profitable, the way the law is now written the government of South Africa can buy back that business. At what price? DR LUKE HAVEMANN: Well, the original position was that they’d have to pay Fair Market Value. That has apparently since changed, under the latest Amendments to the Bill and is now going to be ‘acquisition at an agreed price’. What is an agreed price? What is it going to be? That’s the next question, now. That’s the latest Amendment. ALEC HOGG: So an agreed price between two parties in fact, could be quite a long way from market value. DR LUKE HAVEMANN: It could very well be a long way from market value. The interesting thing is the new legislation says the state is entitled…has a right to exercise that option, so there’s a strength on the side of the law – on the state’s side. ALEC HOGG: So government has approved these Amendments. What happens next? DR LUKE HAVEMANN: The Bill will now go to the National Council of Provinces to be voted on there. After that, it needs to go to the President for his signature to become law, so there are still two steps left. ALEC HOGG: And if it does become law, what is your sense from the industry about how they will react? DR LUKE HAVEMANN: Well, the industry may well challenge it. I know if many of them will be willing to do so, because you don’t ever want to bite the hand that feeds you. At the end of the day, the state is the one that grants you the rights you need in order to exploit our resources, so to challenge them would not necessarily be in your best interest. There may be a backlash. What they may well do is simply relinquish their acreage, start looking elsewhere, and look for a favourable legal environment – further north perhaps. DR LUKE HAVEMANN: Yes, elsewhere on the continent…I suspect East Africa. ALEC HOGG: But surely, there’s a Plan B in all of this from the government’s perspective. If you are putting these draconian measures into law, that will get rid of most Western Investors. Would it be someone in the east perhaps, who is ready to come in? DR LUKE HAVEMANN: Okay, this is all speculation. I’d like to know what government’s Plan A is at the moment; let alone what Plan B is. This sudden change of tack at the moment is leaving everyone with their jaws open, saying ‘what are we doing? What’s the motivation?’ I’d love to understand it and many of us would. ALEC HOGG: Not quite everyone…Rob Davies says that they’re lining up to come in, but as you say, perhaps he’s working on outdated material. DR LUKE HAVEMANN: Look, I think what he needs to do is consult with the industry. The industry – when the news broke – said ‘we weren’t consulted on this’, so let’s consult with the industry, unless he did so in the course of the last week. Let’s hear what they have to say about it.